Preparations are being made for the upcoming inter-Korean summit despite a delay in a proposed working-level meeting between the two sides, officials in Seoul said Thursday. South Korean President Moon Jae-in is set to visit Pyongyang from Tuesday through next Thursday for what would be his third bilateral meeting with North Korean leader Kim Jong-un. 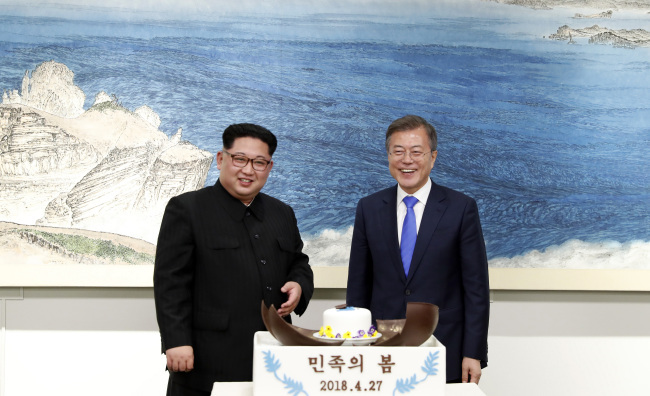 The leaders earlier met on April 27 and May 26 in the border village of Panmunjom that sits directly on the inter-Korean border. The two Koreas earlier agreed to meet early this week to discuss details of the third Moon-Kim summit. North Korea, however, remains silent on a South Korean proposal to hold such a meeting in Panmunjom since the start of this week, according to officials from the presidential office Cheong Wa Dae. "We have not yet received any replies from North Korea as of now," a Cheong Wa Dae official said late Wednesday. With only five days left until the start of Moon's three-day North Korea trip, many are becoming anxious that they may be forced to cut too many corners while preparing for the trip. Still, few believe the inter-Korean summit might be delayed. "We will just have to prepare for the summit without a working-level meeting should there not be any," Cheong Wa Dae spokesman Kim Eui-kyeom said earlier, adding the two Koreas have been and continue to be holding discussions via various means available, which apparently include military hotlines. The two Koreas are also scheduled to open a joint liaison office in North Korea's border town of Kaesong on Friday, which, according to Seoul officials, will provide a direct 24-hour communication channel with the communist North for the first time in history. Moon's chief of staff Im Jong-seok has also hinted that most preparations may have already been made, saying the two Koreas have agreed to keep the number of South Korean delegates to the inter-Korean summit to 200. A Cheong Wa Dae official said the government has almost completed its list of delegates that includes the leaders of at least three political parties, including the ruling Democratic Party and progressive Justice Party. Earlier reports have suggested the list may also include a group of top business leaders, such as Samsung Group's de facto leader Lee Jae-yong. Cheong Wa Dae officials refused to confirm, but President Moon earlier expressed hope that South Korean business leaders would accompany him on his North Korea trip.